One of the premier names in guitar manufacture, Ibanez has produced the Ibanez IJV50 JamPack Quick Start, a fantastically low-priced package with everything for the beginning guitarist. The V50 natural-finish acoustic guitar features a spruce top for fantastic tone. 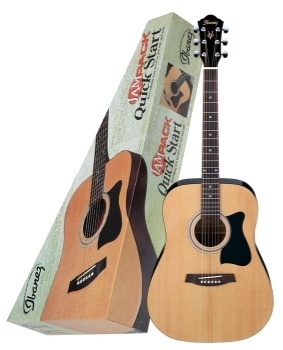 The package also includes an accurate electronic tuner, gig bag, guitar strap, and accessory pouch. Your shopping cart is currently empty. To add an item to your cart go to that items page and click add to cart.